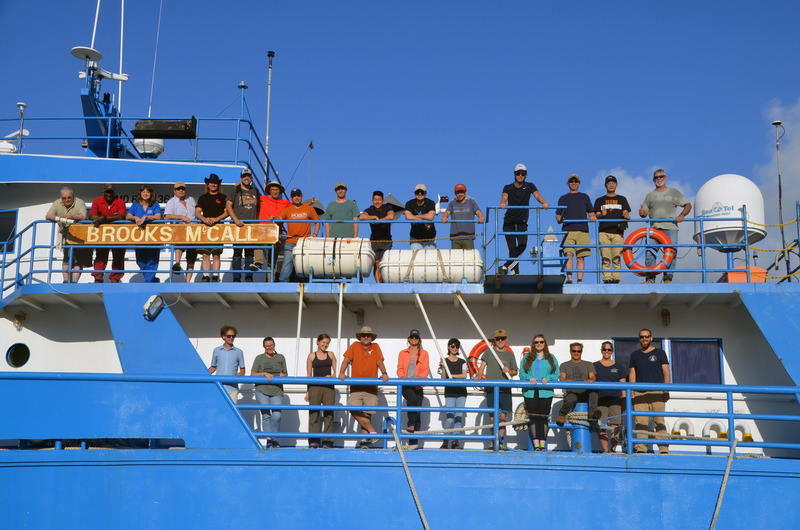 TDI-Brooks International recently hosted the eleventh annual University of Texas at Austin’s Marine Geology and Geophysics Camp on the R/V Brooks McCall (BMCC). 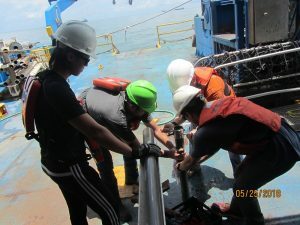 A mixed group of undergrads and grad students went out on the vessel daily to get hands on practice using standard survey equipment. A group of students boarded the vessel at the Maurice Ewing Hall dock at the UT Galveston Medical Branch. The cruise focused on using seismic imaging to capture channels carved by the Trinity River in the geological record. The students deployed two types of seismic technology aboard the Brooks McCall to collect data on the seafloor layers. The Chirp emits a high frequency ping and provides high-resolution data on about the first 30-50 meters of seafloor depth—the same depth where the ancient river channel cuts through. An airgun and hydrophone array provides a deeper look into the surrounding geology, capturing data about the seafloor 75-100 meters down. UT students processing a piston core. Each team collected and processed its own core. For many of the students , this was their first taste of field work and the first time they experienced data collection first hand. The purpose of the course is to teach the students how to run a research survey from conception and planning all the way to the presentation of data findings and conclusions. TDI-Brooks is both owned and operated by world-renown geochemists Dr. Jim Brooks and Dr. Bernie Bernard who have a long standing tradition of partnerships with academic institutions for research and development.